Allan's new version of the Allan Byer Project Band has taken shape over the past several months. 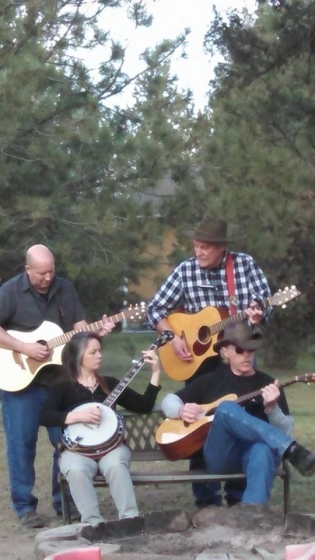 the band now features Rosemarie Witnaur sharing vocals with Allan and adding Bella Flek type licks on her banjo. Jimmy Jo McKue has also joined the mix on lead electric and acoustic guitars and harmony vocals. This Americana Trio, as Byer now refers to it, has been playing shows together during the past six months. It came together with some loose jams last summer at the Pig N Pound in Redmond at some Byer solo shows when he invited his guests to sit in. Veteran bassist, guitarist, and vocalist Hal Worcester is still part of this mix when the venues allow for a larger group or when he plays in Duo format with Allan. Santiago Casinova also joins the group on cohan percussion at gigs for larger venues and festivals. Byer hopes to record his next album with this group of musicians in the months ahead. He has songs enough for a 4th record, most have been in play list several years at this point. "Money Talks Too Much" is a CD with a positive and powerful message. I do like the song, "Money Talks Too Much," as well as "Questions for God," "Dad I Never Had," and "Find A Clue." Allan writes and performs music that makes a person think and that is a good thing. We need more musicians like Allan in our world who write and sing music that causes us to take pause and reflect on our values and beliefs and to make any changes necessary to become better people. To learn more about Allan and his music or to order his CD visit his website at Allan Byer. If you have a positive quote, thought, song, photo, or anything you would like to share with me and my growing audience, please E-mail me at harold@bepositiveday.com. You can also call me at (570) 341-6796. I would be delighted to speak with you personally. Whenever venerable Central Oregon singer-songwriter Allan Byer plays at WineStyles in Redmond (see "If You Go"), he wears many hats. Literally. There's the cowboy hat for Byer's country-ish numbers (like "Pilgrim" and "Storm," radio hits in The Dalles and Eugene, respectively), a wizard hat for his spiritually focused songs, a Redmond baseball cap for Byer's "everyman" tunes such as "Money Talks Too Much," and a tam o'shanter for the Celtic-flavored pieces in his vast repertoire. "Sometimes I even wear as many hats as possible and shake them off during the song 'Sub-Personality Blues' trying to . illustrate the many hats we wear in life," Byer says. He should know about the figurative wearing of hats, too. Byer is a master promoter and gig-getter, always busy playing his wide-ranging, working-class folk music anywhere in Central Oregon with space for a stool. 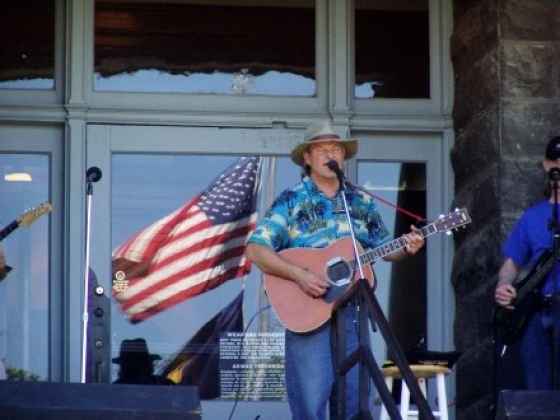 He's also the man behind the live music at Bend's farmers' markets and helped launch Prineville's Ochoco Nights concert series last year. Byer has produced a handful of concerts in the region, including a couple of folk mini-festivals at 541 Lounge in Bend to benefit good causes. And he's had a hand in various festivals, celebrations and other special events over the past several years. Basically, if you went somewhere and there was a folkie performing, chances are decent that Byer was involved. All this on top of his day job as a special education teacher at Crook County Middle School, where he teaches learning-disabled kids not only to read and write, but also to make music. Such is the plight of a bar band. you, but we still like the sound. with the vibrancy of live music. letting them show their talent,"
Wiest said. "It's just taken off." adds that extra piece," Wiest said. comes in to see them," Wiest said. it's a very positive experience." music, and that's OK," he said. real. Somehow it just goes together,"
Indeed, the players love it, too. them between songs of his set. around listening to your music,"
me a chance to share my art." they don't, they don't have to,"
confined by those four walls. of life on the outside. a different mood come over them,"
she said. "It's a little slower pace." Long-time Redmond resident and singer-songwriter, Allan Byer recently released a third CD called Money Talks Too Much which boasts 17 cuts. “This summer, I felt an urgency to record all the old songs,” he said of his inspiration to put the album together. “This summer, we were raising these wonderful hens which we cared for like pets. They’d sit on my daughter Halla’s shoulder and we had become attached to them,” Byer recounted. Cut five on the new CD, “Girl Hold Me Tight,” he said, expresses the importance of the support of others in our lives and that life is fragile, we never really know what’s coming next. That’s the way he wanted it, he said. “There are seven new songs and nine older ones, never recorded. With new arrangements we found new songs in some of the old ones, like cut 17, ‘It’s the Law,’” he said. All but one song on Money Talks Too Much are written by Byer. Arrangements are by Byer and Dean Prescott. The album was produced, recorded and mixed at Prescott’s Mirror Time Studios in Prineville during July and August, 2005. Local musician, Matt Engle mastered the CD at musi-Tech Studios in Redmond. Currently, Byer has been appearing on Wednesday evenings, often with Ed “the whistler” Sharlet at the Old Redmond Depot opened recently by J.C. Puleo who has an interest in showcasing local talent in the restaurant. “We’ve had some killer nights at the Depot,” said Byer. Fans can catch Byer in Bend on Saturdays at Caffé Bellisimo in Bend. On February 16, he’ll play with Ed Sharlet at the Café Libri series of music evenings that take place at the Redmond Public Library. Byer says he regrets that there is a perception, sometimes, that if you’re “local” you’re not any good. 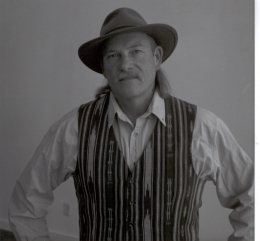 During the summer of 2006 Byer will act as the music director for a new local music show called the “Spirit of the West” to be held in Prineville. 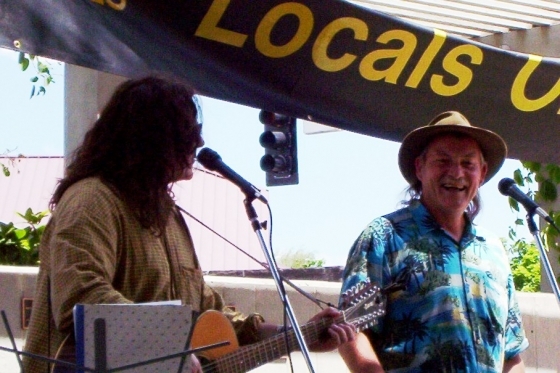 He’s looking forward to providing the opportunity to showcase local musicians. He’ll also MC the show. “One of the reasons I do music is that I get more pleasure out of it than anything else I do,” Byer said. Allan Byer took an aptitude test in elementary school after playing a tonette, and according to the music test results, he had no talent for music. "I never went out for choir," Byer said of his high school days. "I never went out for band." But now, the Crook County Middle School teacher has proven his early detractors wrong - releasing his third compact disc "Money Talks Too Much." Byer, who teaches special education, said "Money Talks Too Much" is a return to roots and is all acoustic. "I wanted to do a simple album that was more like I sound live," he said. "I wanted to keep it simple and get it done. The CD was produced this past summer. 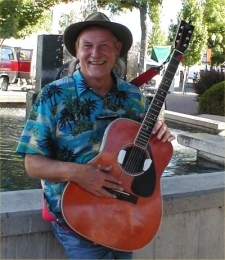 Dean Prescott, who lives in Prineville, plays guitar and percussion on the CD. Mirror Time Records was the production studio. Ed "The Whistler" Sharlet sings and whistles in the background and Kim Lakehomer plays flute and penny whistle on five songs. A particularly proud moment for Byer was when his daughter Halla sings two songs. Matt Engle plays lead guitar on "Falling Down." "I think it's Americana roots musically," Byer said. "The instrumentation is simple. Acoustic guitar, and percussion is tablas and hand drums." In high school, he played a rock star in a musical comedy called "The Apple Tree" and tried acting in college at the University of Portland, playing the lead buffoon in Moliere's "Tartuffe." Slowly, but steadily, Byer became more interested in music, and later met Artis the Spoon Man at Pike Street Market in Seattle. That was an epiphany for him. Byer did his first professional show in 1977 in Eugene but didn't play professionally for another 15 years. "But I could never really get it out of my system," he said. Byer said he has been a serious musician for the last 11 years. 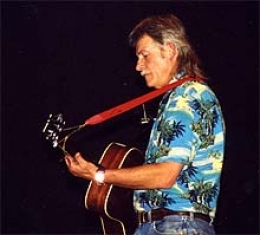 He started playing in 1994 with a band member, Yancey Fall, from Countryfied. From 1983 until 1991, he also worked in alternative educational settings and in treatment centers, working closely with at-risk youth in Eugene and with the Yupik Eskimos in Alaska. "I was playing music and I was using music to reach my kids in the classroom," Byer said. Byer's first CD was "Sometimes It Works" and was released in January 2000. "I've sold more of these than the new ones actually, which is not a million, but it's better than a stick in the eye," he said, grinning. He followed that up with "Your Voice," which was recorded at Musi-Tech Studios in Redmond with Engle. Byer has another project in the works and is collaborating with his electric trio on it. He wants to make a CD of the best of the three albums, including 12 of about 40 previously recorded songs. The others who will perform with him are bassist Hal Worcestor and guitarist Jamie Morris. Byer has told Los Angeles friend, drummer Kevin Michaels, of the latest CD, who has discussed it with several recording companies. Michaels has performed with Bonnie Raitt and Keb Mo, among others. 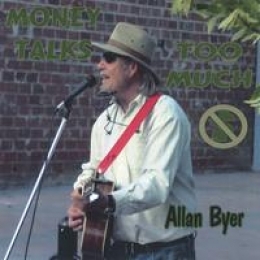 You can purchase copies of "Money Talks Too Much" at various locations, including "http://www.allanbyer.com" and cdbaby.com/cd/allanbyer. The public can hear music from the latest cd at Cafe Bellisimo, 450 SW Powerhouse Drive in Bend, for about a month. 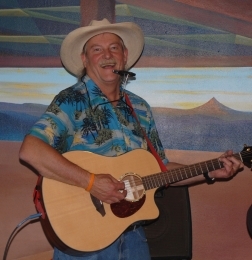 He will also play the next few Wednesdays from 6:30 to 9 p.m. at the old Redmond depot by Wal-Mart. On Dec. 9, there will also be a cd release party at Santiago's, 528 SW 6th St. in Redmond, from 6 to 9 p.m. He also will have a show on "Good Morning Central Oregon" at 7:20 a.m., also on Dec. 9. "Good Morning Central Oregon" can be reached on Channel 11 via Bend Broadband and is on COTV. Redmond singer-songwriter Allan Byer's third and latest album of songs, Money Talks Too Much, makes another snapshot of his progress as a writer, instrumentalist and recording artist available to the record-playing public. According to the liner notes, it also completes a larger portrait, reaching the goal of getting most of the songs Byer has written on disc. Sixteen of the seventeen tracks are new or previously unrecorded, and one ("It's the Law") revisits a song from his 2000 debut release. Byer turned to Dean Prescott's Mirror Time Studios in Prineville for his third crack at a full-length recording. The resultant sound is strikingly clear and sophisticated when compared with Your Voice, Byer's 2003 LP. The folksy instrumentation on Money Talks also steps things up a bit from previous efforts, with Prescott stepping in as lead guitarist, percussionist and producer. A handful of other locals add backing vocals, flutes, penny whistles, and...ahem...whistling (put-your-lips-together-and-blow style, that is). Prescott's diverse approach to percussion, his tasteful sprinkling of echo and distortion over some of Byer's vocals, and his precision with his guitars do much to help keep things engaging through the record's 71 minutes. For his part, Byer plays rhythm guitars and sings the lead throughout. His familiar, smoky-smooth voice is best highlighted on "It's Love," a guitar-and-voice tune that, on top of its instrumental simplicity, comes in as the album's shortest at just over two minutes. Songs like "Falling Down," an examination of inner demons, and "Dad I Never Had," which dives into Byer's painful early family history, cut deeper in terms of subject matter. Those two provide the album's most touching moments. Byer's lyrics, usually interesting, wander occasionally into the realm of verse bending to the cliché-wielding will of rhyme--take this line in "Questions For God," for example: "It takes you / it takes me / it takes us all together / then maybe we'll see / what the world can be." Byer's songs are most fascinating overall when he's in a gospel mode, as in "I Believe" and "Father Make Me." 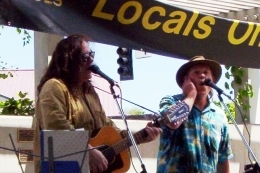 Toe-tapping entertainment value jumps higher, however, with songs like "Food on the Run," where Byer avoids taking himself too seriously with lines like, "Living on Vitamin C, beer and potato chips / while a TV talk show host talks of leaving earth via spaceships," or the title track, wherein economic injustice undergoes a frank, though easygoing, assault. "Attitude" is a gentle kick, though it might best fill a kids' music niche with its simplistically groovy case for politeness. There's so much material on Money Talks Too Much, Byer can't help but hit the sweet spot here and there. If we're lucky, he'll retire from his day job as a schoolteacher soon and fine-tune his artistic focus. Then, he'll surely turn out nothing but gems. alcoholism and how trust in a higher power helped overcome dependence. Byer is helped on this album by the talents of several local musicians. support with harmony vocals; Christen Hawkins also sings harmony vocals. on the album rounds out his normally pared down sound. On Friday, Byer will release his second CD, “Your Voice,” and celebrate the occasion with a concert at the Bend Community Center. His new album was featured on the Homegrown Music Showcase Sunday on KLRR radio, and on Friday, he will make his seventh guest appearance on COTV’s Good Morning Central Oregon show. He performed several times at the recent Winter Fest in Bend and is a regular in the Royal Blend Concert Series in downtown Bend. Byer credits local musicians Dean Prescott and Don Hoxie of The Substitutes, for helping jump start his music career. “They encouraged me to play my original music. In fact, they asked me to open a couple of their shows and took me under their wing. That’s how I got into the professional end.” Marc “Doc” Sackman, who holds a doctorate degree in classical flute performance, accompanied Byer in over half the songs on the album. “He gives me creditability,” Byer joked. Sackman was band director for Central Oregon Community College and was laid off last year due to budget cuts. He hopes to get back into conducting part time and continue working with Byer full time. Sackman will play the flute on Byer’s third album, which should be released this summer. "Compact disc" just doesn't seem to cut it when describing singer-songwriter Allan Byer's new release, "Your Voice". The disc itself is small, true enough, but in terms of the 12 songs' themes--not to mention Byer's two-year effort to get the album made--there's nothing little about the scope of "Your Voice," being celebrated with two release parties next weekend. As he was preparing to play a January DiLusso Coffee, Bakery & Cafe date with his trio, The Bulletin sat down with Byer, 53, to discuss the album, its two-year genesis and the meaning behind the songs. "I would hope listeners would listen with ears that are like fertile ground", Byer said. "Let the songs fall on your ears -- there we go, I got a metaphor going-- let the songs fall on your ears like they're fertile ground, and see if something grows." Among his favorites on "Your Voice" is "Storm," co-written by Halla Byer, one of his three children. "And we need to make not of the 'The Bottle and Me,' Byer said. "It's a song about alcoholism, and I'm in recovery. I've been sober for nearly seven years. Six and a half years; let's be totally honest." While at a glance it could seem that Byer's songs are all over the map thematically, the consistency of the material on `Your Voice,` and Byer's seasoned voice, brings it all together. `We're hoping that people will find some meaning in the songs,` Byer said. `They really range from songs about love, spiritual search (to) just observing nature.` There's a Native American tribute, `Song of the Nations,` replete with chanting. `'Your Voice,' the title cut, sounds like a love song, but it's about a higher power,` said Byer. Another track, `Pilgrim,` is about `being on the search,` Byer said. `Soul Song` is an uptempo song about the soul trying to communicate with the personality, Byer said. It could be a forgotten Doors' song both in sound and its mystical leanings. It's been four years, almost to the month, since Byer put out his first disc, `Sometimes It Works.``Your Voice` was two years in the making, and Byer already has plans to release an acoustic album this summer. Byer is happy to share the spotlight with his collaborators. For the last year, most of his performing has been in the form as a duo with flutist Marc `Doc` Sackman, erstwhile music instructor at Central Oregon Community College who now lives in Portland; and as a trio, incorporating bassist Hal Worcester (pronounced Wooster`) along with Sackman. On the disc, bass duties were handled by Matt Engle, who also played lead and rhythm guitars, harmonica and recorded the disc at his Redmond studio. Other contributors were Steve Kulin on piano, synthesizers and providing chants, and drummer Kevin Lewis. Harmonies are provided by Christen Hawkins and Ethan Allan King, the latter of whom also played mandolin and electric guitars on the album. Byer said. Age, a major issue in the world of pop music, is less of a concern to artists working in the blues and folk traditions, said Byer. `I know my music has grown, and I think you can hear it on the album,` Byer said. Bandmate Marc Sackman agrees. `There are an awful lot of older artists,` Sackman said. `Especially for this type of music. He's not a rap star. We've got some college students who show up at almost all of our gigs. So young people dig it, and older folks are comfortable with it as well.` With Sackman setting up shows in Portland, the two hope to get Byer's music more exposure in the Northwest. `Your Voice` sells for $15 at shows and "http://www.cdbaby.com/allanjbyer" David Jasper can be reached at 541-383-0349 or "mailto:djasper@bendbulletin.com". guitar virtuoso and songwriter from Canada. spent a decade in Eugene. and remastered in Redmond (at Matt Engle's). Byer shows his best stuff as a songwriter. optimistic claim staked out in the title.